Less than 1 in 5 biographies on Wikipedia are about women, join UNESCO launches a global movement on International Women’s Day to help bridge the gender gap in the digital space. 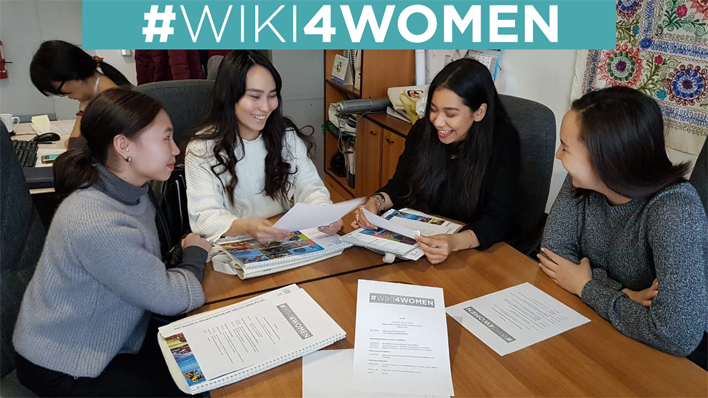 6 March 2019, UNESCO Almaty and Alfarabi Library of Kazakh National University, joined by the United Nations Country Team in Kazakhstan and Roza Otunbayeva Initiative will organize a special event to make the contribution to the WIKI4WOMEN global movement. The Women in the Digital Space initiative calls everyone to take a few minutes of their time to create, enrich or translate, in as many languages as possible, Wikipedia and other digital platforms profiles of outstanding women making a contribution to social and economic development of their countries in the fields of education, sciences, culture, or others. The event is organized by the UNESCO Almaty Office in collaboration with the Library of the Kazakh National University and United Nations team in Kazakhstan. Venue: 71/27, Alfarabi str., 050040, Almaty, Computer class of the Alfarabi Library at Kazakh National University, 3rd floor. Start working on women profiles.